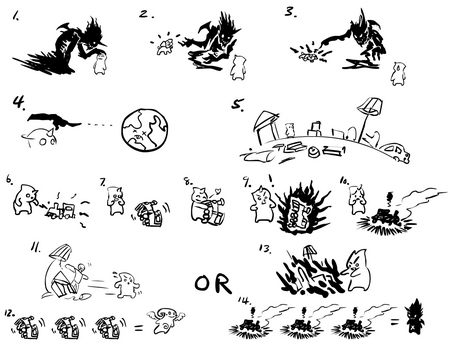 Here are some early storyboard concepts from Abandon. Since animation of inanimate objects was central to the research, you can see that reflected in these two rough fictions. This is one of the early distillations of what we thought the game could be. You were a stranger on a strange planet. Everything around you is still and silent. You touch something. It wakes up! It comes to you! HUGS! But wait, what? It died? What do you do? Will you bring things to life but be forever unable to be with them? Or do you bring them to life but ultimately destroy them?